"Bridges. One day you may need to jump from one." The hilarious zombie spoof Shaun of the Dead introduced the US to comedian Nick Frost. This portly fellow played the perfect calming, yet moronic influence to that film's title character, played by his frequent collaborator, Simon Pegg. Shaun was the first time I had ever seen Frost in action, but I was aware of his other work, including the highly-touted British TV series Spaced. I had never heard of the TV show Danger! 50,000 Volts! until its DVD release, but I was sure it would provide more of the same, (for lack of a better phrase) "British humor," in some form or another. The basic premise has Frost traveling the world (most of the shows seem to take place in the US), and teaching us how to survive various "dangerous" situations that we may encounter, from deadly spiders to choking on food. While the series as a whole is far from being as witty and funny as Shaun of the Dead, there are still quite a few genuinely hilarious moments. The first episode in this set features a great bit that reminds us of a British version of The Crocodile Hunter. The croc wrangler that Frost works with is reason enough to check out this installment of the show, as this guy has to be seen to be believed. What really makes the show entertaining is Frost's interaction with the "normal" people he comes across for the various survival tips. These men and women handle crocodiles, icy water, and venomous snakes for a living, and many of them aren't exactly comfortable in front of the camera. This leads to great fun, as Frost tests a few of these professionals' patience, while never having these gags come across as desperate attempts at humor. He even goes so far as to challenge these experts' knowledge of their respective fields, but none of these people get agitated to the point of wanting to drop the gloves with Frost. Amazingly, I really felt as if I had learned a thing or two about surviving dangerous situations. Of course, the chance I might ever encounter any of these situations is remote, but you just never know when such tips might come in handy. It's refreshing that the show seems to be focusing equally on making us laugh and aware of these tactics, whereas so many projects will do anything for a laugh, and rarely worry about delivering anything of any value. This self-help comedy show continues to teach us lessons in the outdoors with episodes about surviving in the desert without water, handling frostbite, tornados, and even attacks from komodo dragons. It's hard to tell just how much danger Nick Frost is in during these pieces, as I'm sure he's got a competent crew and a team of medics standing by. Still, everything seems very authentic as, unless they're employing the greatest camera tricks of all time, it is definitely Frost, himself, taping a crocodile's jaw shut and performing various other potentially deadly tasks. Frost also throws plenty of pop culture references into the mix, like mentioning Jaws during a shark sequence, and even throwing some obscure bits in there to boot. While the obscure bits might prove frustrating with viewers who aren't overly familiar with their British nature, these references actually piqued my interest in many of the things he mentioned. Regardless of what you think after watching Danger! 50,000 Volts!, here's hoping that this disc might sell enough copies or generate enough interest so that Spaced gets a domestic DVD release. There's plenty of Frost's wacky, Shaun of the Dead-esque antics to go around, as he (temporarily) makes you forget about the amusing antics of "professional" survivalist-types like The Crocodile Hunter himself, Steve Irwin. Image Transfer Review: Each episode in presented in 1.85:1 anamorphic widescreen, and none of them look spectacular. Still, I can't imagine they look much different than they did on British television, which is really all we can ask for from a series that doesn't rely heavily on flashy appearance. Images are soft at times, but everything, for the most part, is easy to make out. Most of the show was shot on location, and the elements are handled surprisingly well, with decent color rendering and accurate fleshtones. Audio Transfer Review: The Dolby Digital 2.0 audio seems to also be on par with how the show would sound on TV. Most of the sound stays up front, but the dialogue is boisterous and always easy to understand, despite Frost's heave British accent. 8 Feature/Episode commentaries by Nick Frost, series producer John Riley, director Matt Gillbe, researchers Kathryn Fish and Allison Vann. Danger! 50,000 Zombies! - Bonus episode focusing on surviving a zombie attack. Danger! Facts! - Facts about the various survival subjects. Extras Review: The extras aren't plentiful, but the ones that are in this set are very valuable. There is an audio commentary track for each of the eight episodes, with Frost participating on all of them, and various other crew lending their voices to other select shows. These are very funny, but there are times where the participants go off on various rants that can be difficult to follow. There's another neat extra on each episode that has a danger sign pop up at various points. When this sign appears, pressing "Enter" pops up a new screen with a fact about that particular subject. This feature can be turned on and off via the main menu. The best extra in the set is the "episode" called Danger! 50,000 Zombies!. This 27-minute piece follows the same formula as the rest of the shows, but focuses on the subject of Nick Frost's career-making film, Shaun of the Dead. A few great surprises are in store during this segment, including the identity of the actor who plays Frost's "guide," Dr. Russell Fell. Danger! Facts! are a collection of the facts that you can choose to have appear during the episodes themselves. Danger! 50,000 Volts! 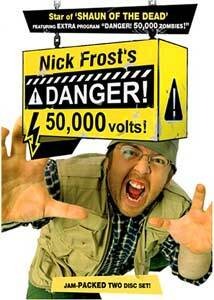 is a nice mix of British wit and wisdom, as actor/comedian Nick Frost takes us through how to survive life's little problems. Eight of the series' episodes are spread out over two discs, along with nice audio and video, and solid extra features as well.